Description: Q159 westbound at Amsterdam. Description: CSX Q127 SB passing a stopped NS train. Description: Two CSX units power this eastbound train into Prairie! Description: CSX ES40DC 5218 trails on Q201 South. 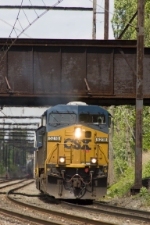 Description: CSX Q136 at Lakewood Rd. Description: Westbound on 1 trash at Chestnut St. Arch. Description: Q703 cruises west through Locust with ES40DC 5218 and SD40-2 8042 in matching YN3 liveries. Description: L031-30 approaches Woodbourne westbound through the Fall Snowliage. Description: I heart you, too! Description: Doing about 5mph while entering a totally plugged up Kingston yard. In total there were 6 trains either in or trying to get into the yard this busy afternoon. Description: Q439-14 rips west at Big Oak Road as they approach CP Wood with CSX ES40DCs 5443 and 5218 for power. Title: Northbound CSX freight behind a pair of GEVO's getting underway out of Rocky Mount. Description: CSXT 5218 is actually the trailing unit of a 3-unit GE consist at Old Kings Road.